Gratins feature very heavily in French cooking. Essentially they include vegetables of some sort covered in a white sauce and popped under the grill. Most cultures have their form of vegetable gratin including a famous British cauliflower cheese. 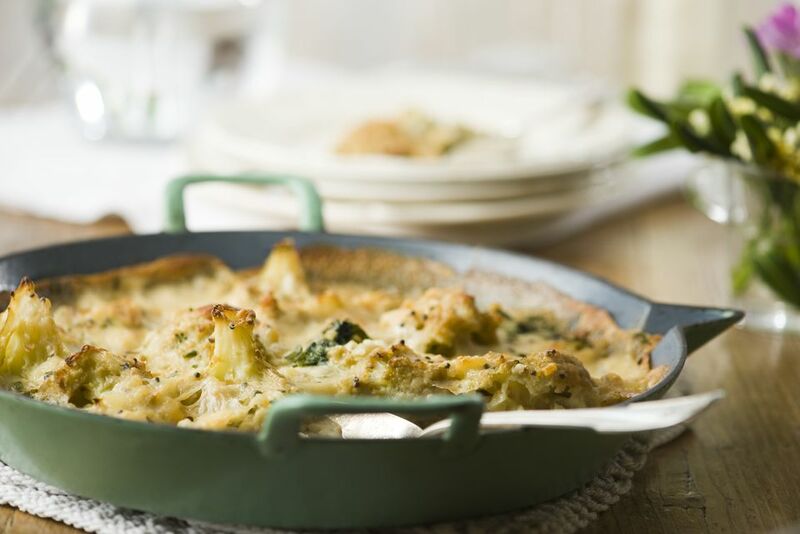 Creamy and comforting, this cauliflower gratin recipe features a classic Béchamel sauce punched up by just a little bit of fresh thyme. This gratin is a classic at Provencal tables and is often served for the traditional meatless Christmas Eve dinner, gros souper. Cook’s note: This recipe makes extra Béchamel sauce, which is perfect for drizzling on steamed vegetables. Preheat an oven to 375 F. Butter a 9-inch by 13-inch baking dish and set it aside. Steam the cauliflower in a large pot of boiling water fitted with a steamer basket for 5 to 7 minutes, until the florets are just tender. Rinse them in cold water, drain, and arrange them in a single layer in the buttered dish. In a large saucepan over medium heat, melt the butter and whisk in the flour until it forms a smooth paste. Continue whisking, cook for about 2 minutes, and then gradually – 1/3 cup at a time add the milk. Continue whisking and cook until the sauce is completely heated through, smooth, and thickened. Remove from the heat and season with the salt, thyme, and nutmeg. Pour 2 cups of the Béchamel sauce over the steamed cauliflower and gently toss the florets to make sure they are thoroughly coated with the sauce. Bake the gratin, uncovered, for 15 minutes. Stir together the grated Gruyère cheese and breadcrumbs and sprinkle them over the gratin. Bake it for an additional 10 to 15 minutes, until the gratin is hot and bubbly and the cheese is melted and browned. Sprinkle the surface of the baked gratin with the ground pepper and serve hot. One of the most obvious combinations on the cauliflower is to include another brassica, such as broccoli. Spinach makes a great addition, as does super-healthy, ever popular kale. The kale should and spinach should be lightly steamed before using on the dish. Add into the gratin dish before pouring over the white sauce.